JENNY LEE gained admission to the State Bar of California in 1991, and thereafter became registered to practice before the U.S. Patent and Trademark Office as a patent attorney. She completed her undergraduate degree in three years and graduated in 1988 from the University of California, Irvine with a Bachelor of Science degree in Biological Science. 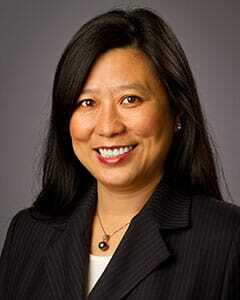 She received her Juris Doctorate degree from University of California, Los Angeles in 1991. Ms. Lee’s practice focuses on providing advise and counsel in all areas of intellectual property law, including patent, trademark and copyright, as well as prosecuting, registering and enforcing domestic and international intellectual property portfolios. She is admitted to practice before all state and federal courts in California and the Ninth Circuit Court of Appeals. She has handled numerous multi-million dollar complex business matters involving various technologies for both Fortune 500 companies and start-up companies. Ms. Lee presented "How to Protect Your Intellectual Property" at the 2005 ChaRM (Challenges in Regenerative Medicine) Conference in Toronto, Canada. During college, she conducted extensive research in the field of learning and memory and was a contributing author of an article entitled "Lesions of entorhinal cortex produce a calpain-mediated degradation of brain spectrin in dentate gyrus," published in 459 Brain Research 226-232 (1988). During law school, she assisted Professor Mari Matsuda with her article entitled "Voices of America: Antidiscrimination, Law, and a Jurisprudence for the Last Reconstruction," published in centennial issue of the Yale Law Journal (100 Yale L.J. 1329-1407 (1991)). Ms. Lee is fluent in Mandarin and Cantonese.